Yesterday morning the weather was perfect - no wind, sunshine and blue skies. I decided to walk along the foreshore to the Mullens roost. When I first arrived down there the mist was still hanging over the hills on the far side of the bay. 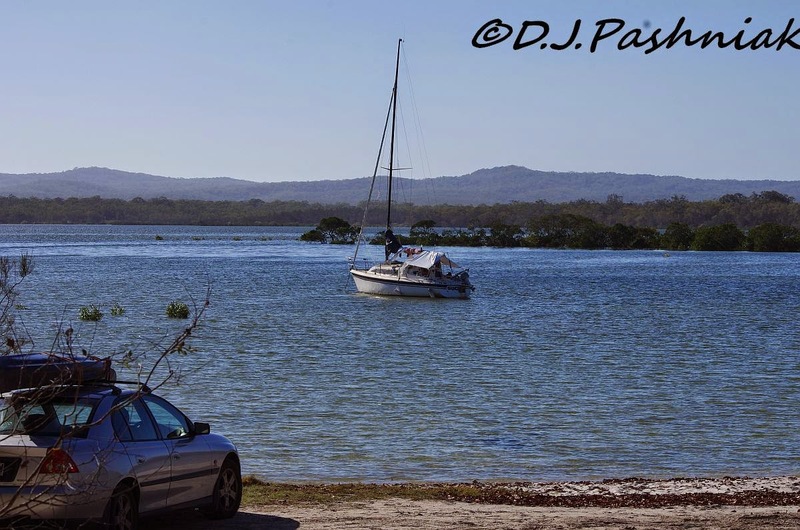 As I walked along I noticed that a yacht that had been anchored immediately off from the picnic area was slowly moving down the creek and then along the far side of the bay. This photo is taken a month ago from the picnic area while the boat was at anchor. This photo is taken the other morning as it moved slowly down the far side of the bay. The tide was fairly high inside the bay where the roost area is. As I walked out on the sand flats that were still exposed I wondered how well my dog would act. It has been several months since we walked down this way and even longer since we came down here looking for shorebirds. However, without any prompting from me she walked carefully behind me and stayed tucked in just behind my legs as long as I was taking photos. We were there for a little more than half an hour and she hardly moved during that time. She is the smartest dog I have ever had! The water looks beautiful but despite that lovely blue color it is only a few inches deep and even in the middle is only about waist deep.This is habitat that the birds love! Most of the shorebirds have already left for the northern hemisphere and their breeding grounds. When I first walked onto the roost I couldn't see any birds at all but then I saw some fluttering above a sand bank far over on the left. When I got closer I saw that most of the movement was being caused by little Red-capped Plovers. They always seem to be moving along the ground or fluttering just above it for a few wing beats. There were also a few Red-necked Stints among them. These are our smallest migratory shorebirds. ...but in this picture the water is so still that even the eye of the bird on the left is perfectly clear in the reflection. 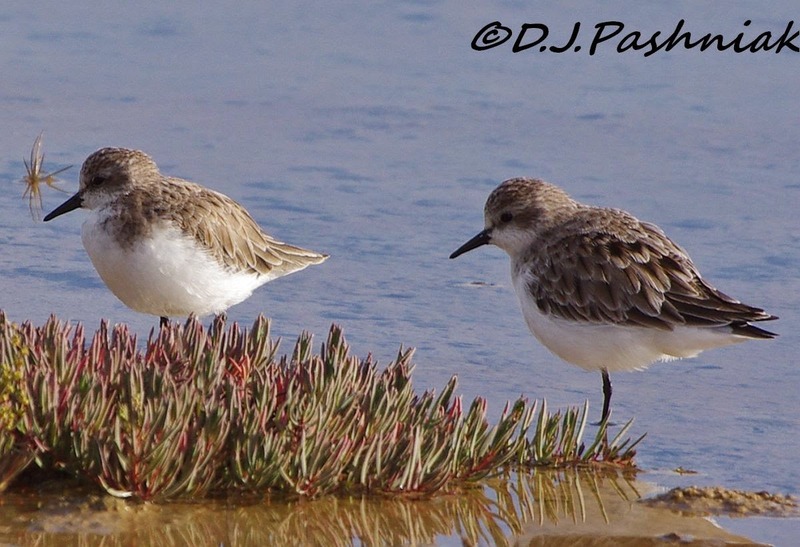 These Red-necked Stints are not showing any breeding plumage so must be young birds that will spend the winter here. I always think these tiny birds are so cute - and even more so when they stand and have a good scratch for my camera! In the early morning like this the light strikes up from even tiny ripples and creates lovely patterns of light and shade on whatever is above it. I spent quite a long time photographing plants and trees overhanging the water and hoping to catch some of these light reflections - but the only place I caught these reflections was on the front of this bird and reflected in the water below it. I think to catch these patterns of light and shade on the bushes I would need to use the video - and keep it very still as well! Mick, your photography just gets better and better - another delightful post. love those cute plovers! so darn CUTE! 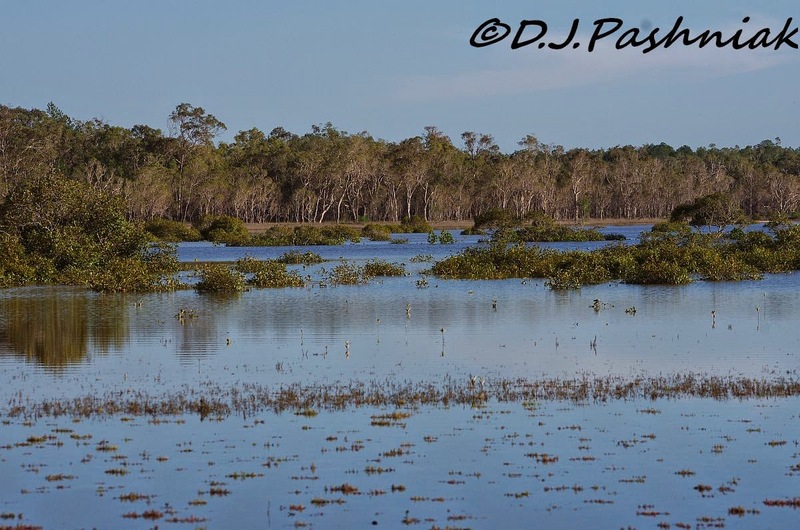 Mick, that vast area of shallow water looks very idyllic with all those waders feeding away. And warm! 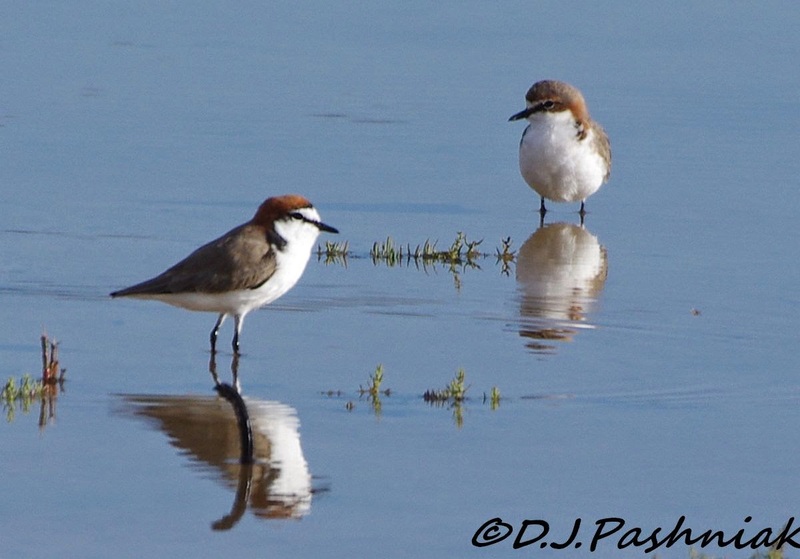 The Red-capped Plovers look absolutely beautiful in their summer plumage. I agree that all tiny birds are cute, it just makes it that bit harder to fill the frame. The little plovers are so pretty. I was hoping to see a photo of that good dog! I love the Plovers. Great photos of a beautiful area. Terrific captures, Mick, as always! I do love the Plovers! Thanks for sharing the beauty!! Beautiful scenery, Mick! 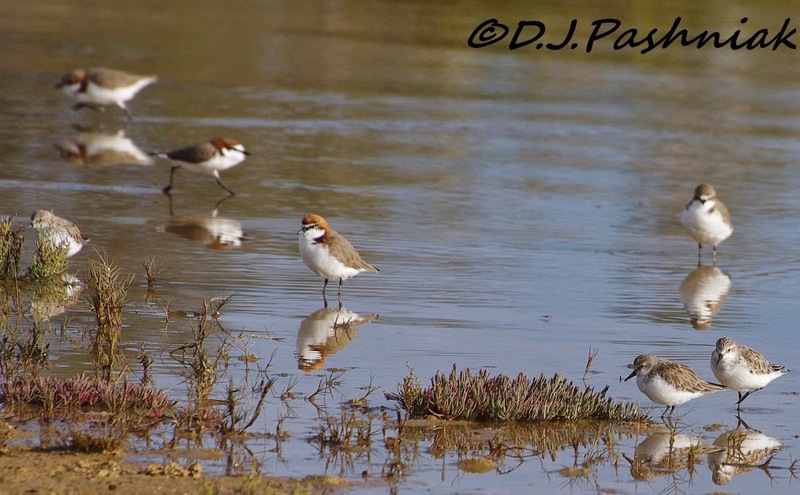 And I love the cute shorebirds, especially the Red-Capped Plovers.. Enjoy your week! 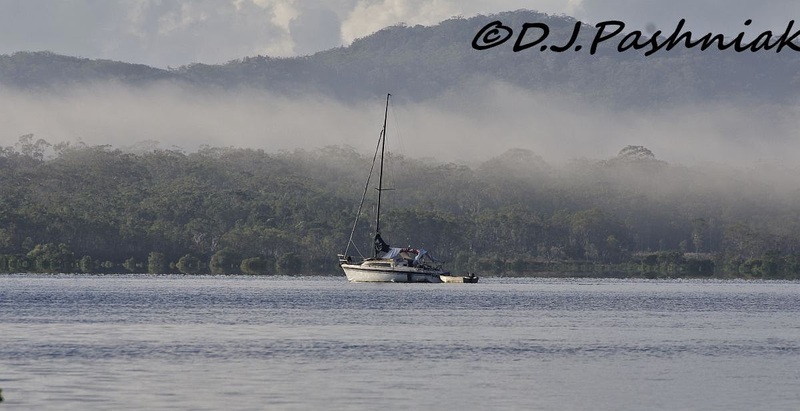 What a beautiful image with the boat on the water and the misty scene. Lovely. Wonderful images of the birds. I am glad your dog was a good girl for you. The shorebirds, they're adorable. Very pretty reflections too. I'd love to be floating around on that boat! 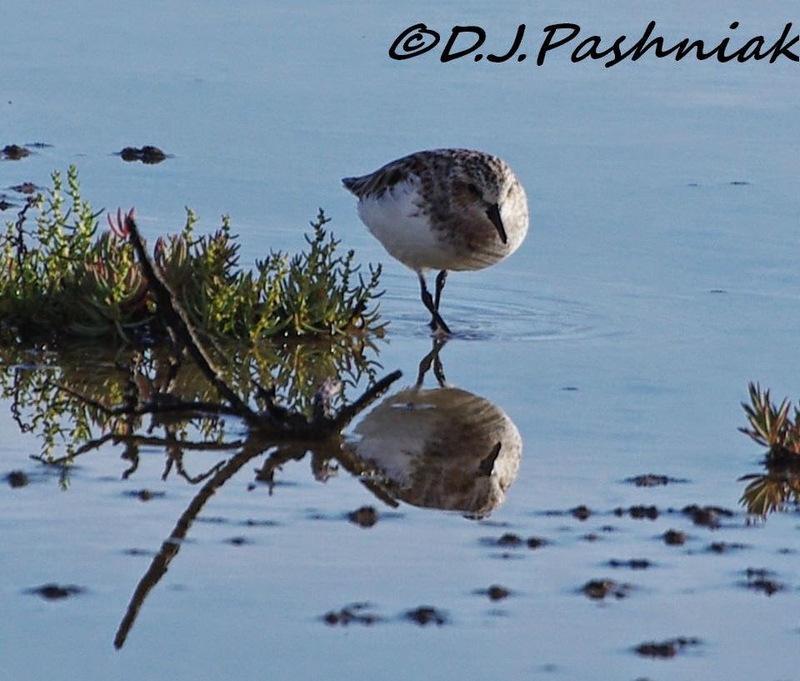 Your shorebird photos are excellent, love the reflections! I can't take my dog with me if I want to get photos, he even goes berserk if he sees a butterfly! Gorgeous images, I love the reflections of the birds, and they are really cute. Best Wishes. You have the best shorebirds. 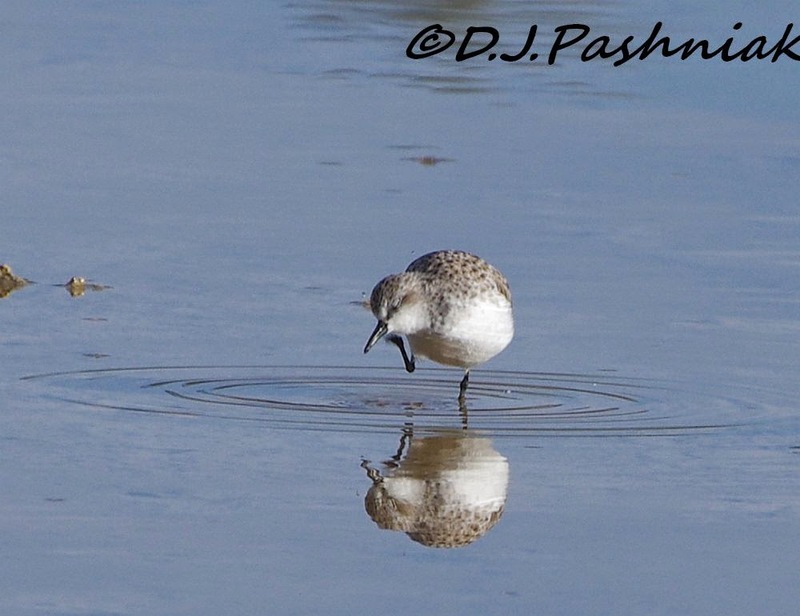 The red-necked stints are so round and cute ... and that one scratching is adorable. Some people have a bird dog. You have a birding dog! If I had a dog, I would definitely want one like yours!! Pretty area, and the plus side is all the spectacular birds to show off through your lens!! That one that is scratching is adorable. Like your reflection photos, especially the one with two little birds and one of its eye is reflected too. And the scratching bird is so cute. Beautiful shots love the reflections. Nice pictures - I have to admit it is a little more convenient when the birds stalk you, rather than the other way around! nice to see those cute little birds. Looking forward to find some up here. Gorgeous place! 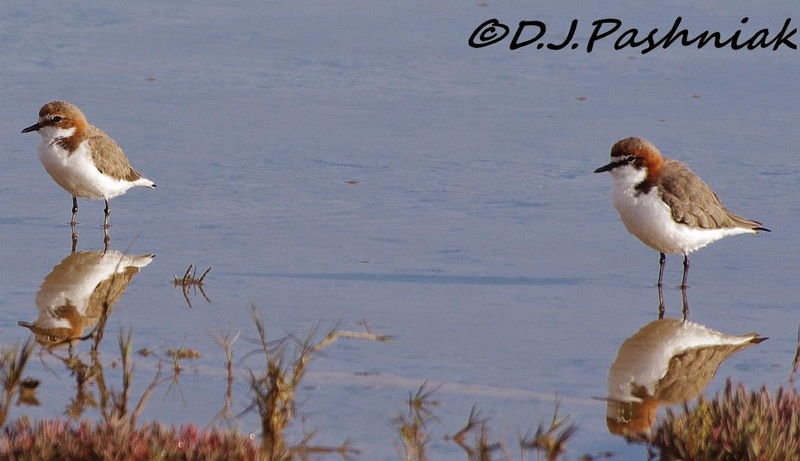 The plovers and stints are wonderful, and you got some great shots, especially the one with the reflection! Love how peaceful it is there! What a good puppy you have not to tear off into the low water, scaring the birds! Thanks for coming by my blog last week for Wild Bird Wednesday!